Using the latest technology, the Mixto CO2 fractional laser, patients can remove decades of skin lesions. The Mixto laser uses a laser beam to penetrate the deepest depths of the skin to tighten collagen fibers while leaving the surrounding skin intact for quick healing. Dr. Markmann provides patients in the Baltimore area with a non-surgical procedure to reverse signs of sun damage and aging through laser skin resurfacing procedures. 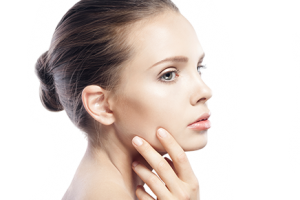 Laser skin resurfacing is also referred to as lasabrasion, laser vaporization or laser peeling. The Mixto CO2 refractional laser removes the outer layer of skin and heats the underlying layer to stimulate growth of new collagen fibers. During this process, damaged skin cells on the outer layer are stripped away, leaving a new layer of healthy skin to grow. If small sections of the face are being addressed, the procedure will typically take about 45 minutes. A full-face treatment, or larger areas of skin, can take up to 2 hours. Multiple sessions are sometimes needed to attain the desired results. The Mixto laser is an ablative procedure, which means that both the epidermis and some of the underlying dermis is removed in order to promote collagen growth for new, healthy skin. During an ablative procedure, an intense beam of laser light energy is directed at the skin, removing the outer thin layers. This process generally results in a longer recovery. The results, however, can be a bit more dramatic. During the consultation, a determination will be made as to whether a patient is fit for an ablative or non-ablative procedure. Among many practitioners, the Mixto CO2 laser is the gold standard in laser skin resurfacing for the ablative process. The treated area may appear red or pink for several weeks. It is common for the face to have crust and scaling as it heals. Normal activities can usually resume within a couple of weeks. Patients who have sensitive skin or who have had adverse reactions to facial products may have increased side effects. Laser skin resurfacing will leave the face exposed with a new layer of healthy, yet sensitive, skin. It’s advised to wear sunscreen every day and limit sun exposure as much as possible.